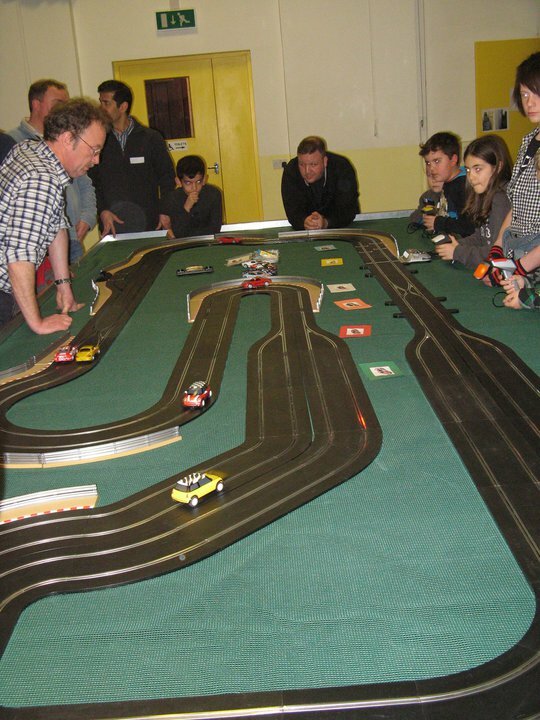 Hy-Speed started in January 2011, (after several months of preparation), to offer a relaxed and friendly club where men, (and their children aged 7+), could enjoy the fun of 6 car, multi-lane Scalextric Digital slot-car racing. 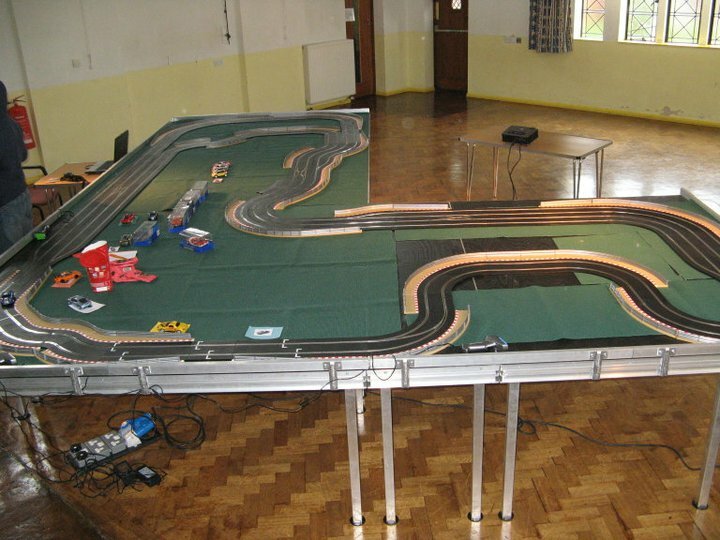 The initial track and cars were funded by generous donations from both Highbury Congregational Church and The Midcounties Co-operative, to help support activities in the local community. Since then the club has grown steadily, allowing the size of track and the number of club cars to grow way beyond our expectations. Also, due to popular demand, the club is now open to all adults for Family Meetings, for that ultimate competitive (but fun) experience. 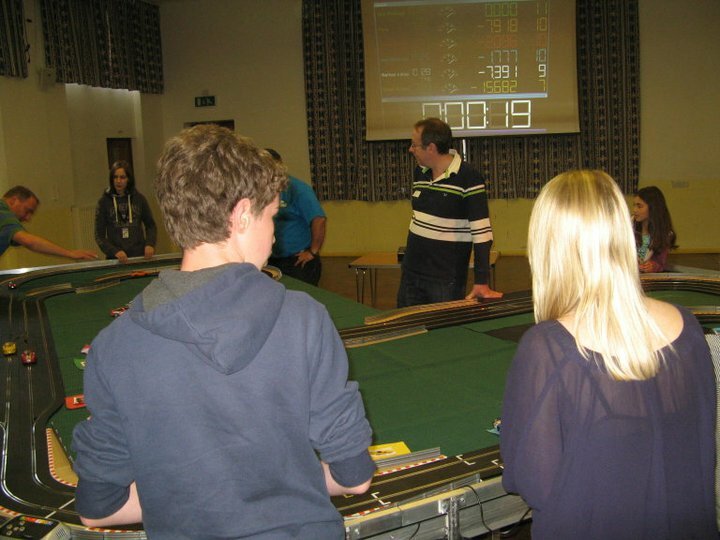 Scalextric Digital is the latest development of the Scalextric brand. Using digitally chipped cars the system can allow up to 6 cars to race simultaneously on the same track. The digital throttle controllers now also provide 2 extra buttons, for braking and changing lanes. When timed correctly, cars can change lanes while passing over special points sections of track, enabling overtaking and / or lane switch for the best racing line. To work on this new digital system cars must be fitted with an appropriate controller chip, which contains the speed controller, and circuitry for lane changing. Most new Scalextric cars are DPR, (Digital Plug Ready), meaning the chip can be inserted without the need to modify the existing wiring in the car, however older analogue cars can also be modified too. Please speak to any of the Hy-Speed marshals if you need more information on this. The Hy-Speed track has grown considerably since we first began. 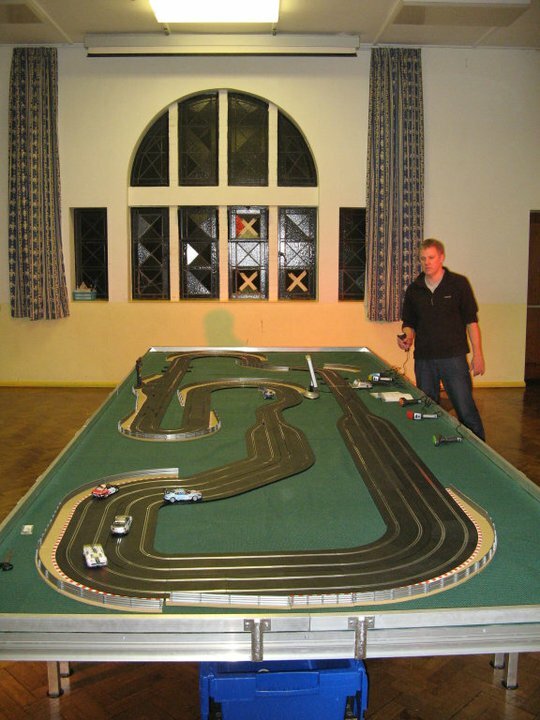 We started out with the Scalextric Digital Pro GT set and have subsequently invested all the monthly income to increase the size way beyond that of your average living room setup. The track is assembled on professional staging decks which are fully configurable to allow us to build a variety of different shaped layouts. Each deck is capable of holding 2 tons of weight, and due to the way they securely interlock it provides the ultimate stable base for any track. (At the time of writing the decks currently measure 8 x 2 meters).